Yes, I warned you that we are avid Disney Fans... last night we went again! I'm not a fan of Disney's "Theme" for the year. For those of you who don't know what that means - each year Disney picks a "Theme", last year it was the "Year of a Million Dreams", this year it is "Celebrate Today". Okay, guys. Good concept, but the execution of it is really lacking in some parts. 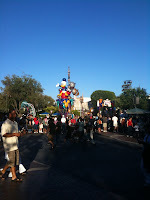 I think it is fantastic to offer guests a free day at Disneyland on their birthday or equal cash (!) compensation for passholders, but I think the new parade is TERRIBLE. The parade this year to me is not worth ANY effort to watch. In the past there has been tremendous creativity and magic designed in to the parade that has always made it in my opinion worth the effort to hunker in and save a spot. This parade just annoys me. Let's face it, Disney for years has always made the better parades for Disneyland and left the less than exciting parades for California Adventure. Now it's the opposite! We hopped back and forth between both parks last night and without a doubt the Electrical Parade at California Adventure is a million times better than the Celebrate Today parade. Disney missed the mark with the Celebrate Today parade. I mean, really, did they think that basically just putting a bunch of the characters on moving floats with loud music and dancing with the crowd would be enough? Not to this Disney fan! I'd much rather see them bring back the prior parade which was full of elaborate floats. (And of course, we planned our entire evening using the iPhone Walkee Guide App. To be honest, it was the entire reason we decided to go! We saw that the lines weren't bad and it would be worth the effort to head up there at 4pm!) Stay tuned for a review of the restaurant where we ate dinner). I agree, I saw the Celebrate Today parade and didn't "love" it like the orignials that gave me goose bumps.